Kepa grew up on Kaua‘i and graduated from Kapa‘a High School. He is currently attending Kaua‘i Community College, and will be graduating with an A.S. degree in Electronics Technology. After graduation, Kepa plans to pursue a bachelor’s degree at UH Manoa. In his free time, he enjoys surfing and spending time with his family. Project Abstract: The Smithsonian Sub-millimeter Array (SMA) utilizes eight antennas atop Mauna Kea to collect submillimeter waves from astronomical objects. Within each antenna, there are four RF receivers collecting these waves, however if the beams are out of alignment in dual-receiver observations, the efficiency of the receivers degrades. In order to correct the misalignments, SMA has developed an RF Beam Scanner to install within the antennas for aligning the individual receivers. The RF Beam Scanner can scan a square raster up to 25 mm in the plane of the beam waveguide system where images of the sub-reflector and the receiver feed horns are formed. Post processing the analog data can generate a digital amplitude and phase map. Using the amplitude and phase maps, the SMA can assess the optimal centration of illumination over the RF receivers, and achieve co-alignment by adjusting the optical mirrors. Currently the RF beam scanner is an assortment of electronic components, along with disordered cables and connectors, causing assembly within the antenna array to be a time consuming hassle. Having roughly a six-hour window for beam scanning and RF receiver adjustments per day, it is very important to maximize the efficiency of assembly time for the RF beam scanner. 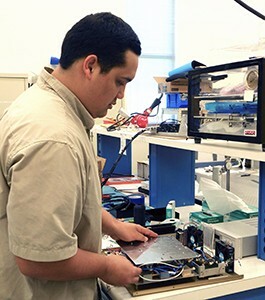 We accomplished this by repackaging all current hardware into a single chassis and consolidating power supplies, cables, wires, and connectors into a clean simplified form, creating a substantially more user-friendly RF beam scanner for assembly, and increasing mobility within the antenna array atop the Mauna Kea summit. The simplified final form of the RF beam scanner will also greatly decrease assembly time and generate a more efficient window for RF beam scanning and RF receiver co-alignment throughout the array.